A picture is a worth a thousand words. 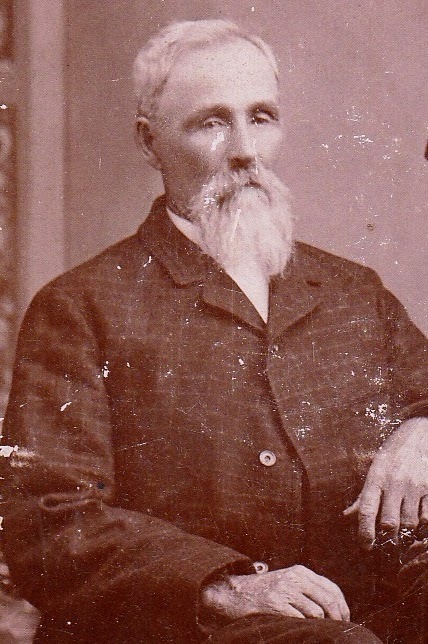 After I discovered a photograph of my 4th great-grandfather George Chalkley Haworth (see Facebook Tags Forgotten Ancestor), it seemed appropriate that I add a few more words and assemble a profile of his life. George Chalkley Haworth was born January 16, 1833 (according to his headstone) in Indiana to parents Mahlon Stanton Haworth and Mary Hockett. The family moved to Iowa before 1850. Although he was disowned for "marrying contrary to the faith," Mahlon had belonged to the Religious Society of Friends, and, it would seem, adhered strictly to Quaker doctrine throughout his life. Mahlon was an ardent abolitionist; a trait closely aligned with the tenants of his faith. According to Bryn Mawr College (a Quaker founded institution), the Religious Society of Friends was the first organization in North America to "fully condemn slavery as both ethically and religiously wrong in all circumstances." It was discovered, years after his death, that Mahlon's Iowa home contained secret rooms that hid slaves escaping to freedom on the Underground Railroad. This was the environment in which George Chalkley Haworth was raised. These were the values to which he was exposed. On October 29, 1859, George married Mary Emily Hadley in Warren County, Iowa. They had three daughters, including my 3rd great-grandmother Iva Elzina Haworth. The marriage was short lived. 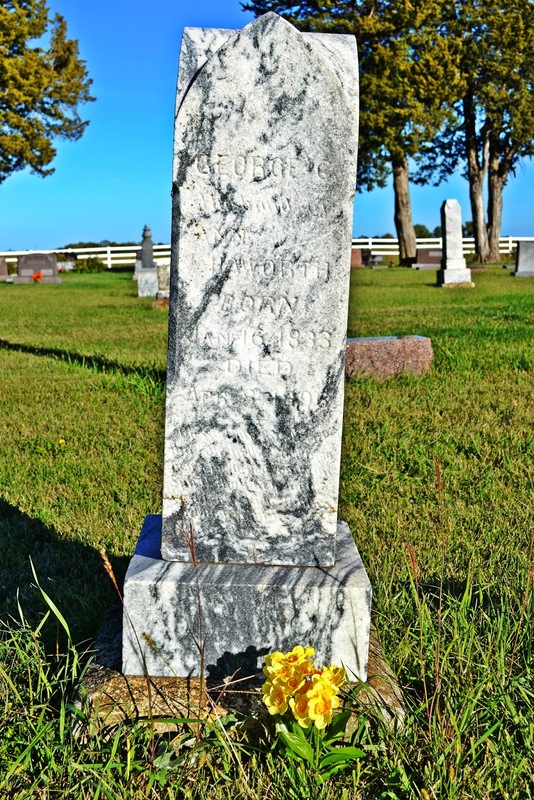 Mary passed away in January 1865, and was buried in Ackworth Cemetery in Warren County. Her headstone indicates she was 25 years old. Two years later, on March 21, 1867, George married Ann Simon in Warren County, Iowa. They had five daughters - all born in Iowa. A son would be born in Kansas. In about 1880, George and Ann Haworth loaded their family and possessions into a covered wagon and followed his brother Mahlon Haworth, Jr. from the prairies of Iowa into Kansas. A granddaughter of Mahlon Jr.'s later recounted the journey across the plains in Reflections of the Old Homestead. She describes a long and tiresome trip. "They traveled slow by day and camped before dark...The teams of horses couldn't make it more than ten to fifteen miles per day, depending on the weather, for the wagons were loaded and heavy. The roads were just two wagon wheel paths made by the wagons that traveled this route...the miles from Indianola passed slowly." Their search for a new home came to an end when, as Mahlon Jr.'s granddaughter recounts, "they rode down a hill...a valley spread out before them with a muddy creek winding through the valley of trees." Mahlon Jr. said, "well I believe we have found our spot!" Most of the other travelers in the wagon caravan continued onward, except George who "spotted a place up on the hill a piece from Mahlon's." There was another influencing factor in the Haworth brothers' decision to settle where they did. In a 2012 academic article, Haworth: Flag Stop Town in Republic County, Kansas State student Rebecca Hall notes that they set up homes near a pre-existing rail line. "When looking at the 1884 Plat map of Republic County, the establishment of the little town in that specific area seemed to be perfect for the time. The track curved through the eastern portion of Republic County mostly parallel to Mill Creek; its meandering ways continued until running through Cuba, Kansas." In the ensuing years, George and Mahlon Jr.'s family settlement grew into a proper town, appropriately named Haworth. In 1991, The Belleville Telescope ran a feature that included reflections from Haworth's former residents (by that time, the settlement was a ghost town). "Haworth may have never been much more than the dream of its founders, George Chalkey [sic.] Haworth and his brother, Mahlon Haworth, Jr.," but, as the paper observed in 1901, it was a "beautiful little city in the eastern part of the County. It has a population of 20. It being situated on the B and M railroad and Mill Creek makes it an important business center." The greatest indication that the town of Haworth was on the map, so to speak, came on May 5, 1884, when a post office was established. George was appointed the first postmaster. Hall notes that "the post office was more than just a place to collect mail; it covered a need that was similar for many people in rural Kansas in the late 1800's. Residents needed a way to communicate with the rest of the world, to keep in touch with families and friends beyond their little plot of land on the prairie." It would be from this post office that the photo of George C. Haworth and family was mailed to my 3rd great-grandparents Edmond and Iva (Haworth) Hawks. George wouldn't live to see the town's continued growth or its subsequent decline. On April 8, 1896, he passed away and was buried in the Hawks Cemetery just outside of Haworth. His headstone still stands prominently in the sea of surrounding farmland. After the turn of the 20th century, the town began to decline. The post office was closed in November 1910. Families moved to bigger settlements. Buildings were torn down and the materials were used to create new structures. Eventually, the land reclaimed remaining foundations and quietly erased the town, relegating its existence to memory and its founder to a photograph.